Type of event: public screening for kidney disease and associated diseases. Public screenings on World Kidney Day are organized often and in several countries across the world. A public screening for kidney disease is free public health service performed by doctors, nurses and health professionals. It is usually sponsored by a hospital, foundation or NGO. Stands and/or mobile units are set up in a public space like a city square. People are free to participate. During the screening participants are asked questions and offered tests to check whether they already have kidney disease or they are at risk of developing it. Doctors also give participants educational information about kidney disease and distribute flyers and material that can be useful to increase awareness. Dr Ludovico La Peccerella is a nephrologist from Benevento near Naples, Italy. He has co-organized public screenings for kidney disease in his town for many years. 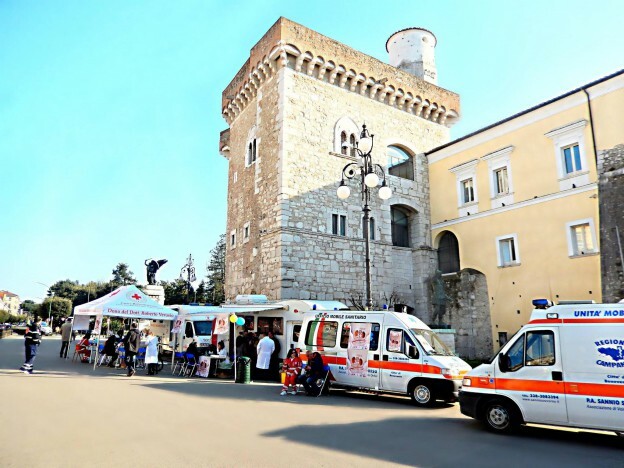 The initiative was sponsored by the Italian Kidney Foundations and supported by the volunteers of the Italian Red Cross, the Sanniosoccorso organization and two more dialysis centers. Some 20 volunteers helped monitor members of the public. He spread the word by advertising the event across the town, in newspapers and on social media. On the day, the team approached the public to generate attention. Data collected from these screenings has been stored and used by the Italian Kidney Foundation for an epidemiological study aimed at improving knowledge of kidney disease prevalence in Italy.